It’s seems there is a lot of convergences between the community management of a coworking space and what we used to hear regarding social media online community management. “I’m like a curator. I know the community of the members very well. I know who they are and what they do. I’m always looking how to foster connection between them”. The term curator has been coined for the management of museum collections. The last year, however, the word curation was used by social media specialists to describe the process of editing and push informations on digital social platforms, in order to generat more attention from online communities. It’s interesting to hear the concept of curation used in a coworking context as well. This likely demonstrates how the growth of coworking communities (offline) is tuned with the today’s expansion of communities online. It likely underlines our modern hunger for more social relationships in general. “Coworking spaces intend to get rid of the former 50’s born sterile working environments and bring again more humanity in the workspace”, stresses Iris Kavanagh. Next Space recently raised 425.000 $ in order to develop new spaces in California. Raines Cohen, our “Coworking Coach”,was holding out his iPad displaying this phrase in front of the crowd, during the wrap-up session of the Coworking Unconference in Austin, on March 10th 2011. Basicaly, it summed up one of the general feeling that surfaced during an afternoon of workshops. Altough coworking is firmly growing all around the world, it has, so far, not demonstrated is was a very profitable business. In Austin, some coworking space owners conceded that, if they had indeed reached the financial breakeven, they often had to give up their own compensation. Fullfilling the passion for connecting people with each others and build the local community is a sufficient reward for some of them. Others say they keep a second professional activity to secure a complementary revenue. Question : how sustainable is that kind of “altruistic” model on the long run ? According to Emergent Research, a research firm on Small Businesses, mentioned by Deskmag, the annual morbidity rate of coworking spaces in the US is 20%. 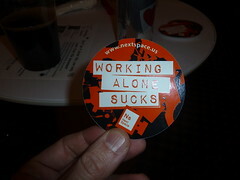 Why is coworking less profitable than business centers altough it offers better care ? 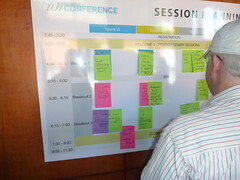 We had this discussion with the representative of one of the conference’s sponsor. What would be the solution ? To increase the price of subscription as opposed to the tariff of business centers ? Doesn’t a better service deserve a higher fee ? As a matter of fact, we heard of different business model in Austin. First, public authorities, it appears, are more involved in the funding of Coworking spaces in the US than we would think in Europe. Gangplank in Chandler (Arizona), is a non profit organisation designed for coworking. The association got a 400.000 $ grant from the local authorities. Entrepreneurs and freelances aren’t even charged for working in the space. CoHabitat, based in Shreveport (Louisiana), is another example of a publicly funded coworking space. “It’s nothing but normal, we are doing the job of economic development agencies”, tells CoHabitat. If public funding can provide the kickoff seed, other funding models exist. Some coworking spaces, for instance, launched community subscription, crowdfunding or micro-lending to start up. The model seems to generate a lot of engagement within the community. It’s not specific to the US. In Europe, for instance, The Hub Brussels raised money twice via its network of careholders. Can/should coworking be a real business ? Though, we may think that all coworking spaces aren’t able to create such a commitment from their local community of fans. Coworking can definitely expand as a business. There are today evidences. New Work City, for instance, in Manhattan, attracted the sponsorship of the Pearson group. The company has found a great value in coworking. “Pearson plans to tap into NWC for talent, get feedback on our digital products, and potentially partner or invest in some of the community’s startups”, writes the press release. NextSpace, in Santa Cruz (California), has opened a new era for coworking. The company just raised 425.000 $ from investors. NextSpace (280 members) is already operating two spaces and is planning to open up three more in California. NextSpace is offering a bunch of other services on top of a desk and connections. It seems to increase its its revenue stream. New Work City and NextSpace, as well as many other coworking spaces we met in Austin, are fiercly commited with the values of coworking (openness, collaboration, connection, engagement, sustainibility, sustainability…). They ackowledge that community is the most important dimension in coworking. Next to non-profit coworking spaces, it seems there is definitely room for for-profit coworking spaces. The latters are likely to speed up the development of the coworking movement, for the good sake of the movement. What could we learn From an European perspective ? The maturity of the coworking market is slightly higher in the US than what we can observe here in Europe. The US experience is very instructive. Based on the evolution of the North-Amercian coworking movement, we can open up the debate already and boost our level of awareness about the growth of coworking in our European countries. Liz Elsam is the founder of Link Coworking, a coworking space based in Austin, Texas. According to Liz, the number of Coworking spaces in the city could easily double in the middle term, to reach more than 25 units. “We already see a kind of specialisation of each coworking spaces, according to, a.o., age or gender. Other spaces, for instance, have an audience more focused on techies and web developpers”, observes Liz Elsam. The proportion of freelances and contingent workers increases among the working population in the US. As a consequence, the coworking market is going to grow steadily in the years to come, predicts observers. In Austin as well as in North America in general. In Europe, there is no reason we should think similar changes in the workforce distribution won’t support, in the near future, the development of the coworking market either. Angel Kwiatkowski is the founder of CoHere, a coworking space based in Fort Collins, Colorado. 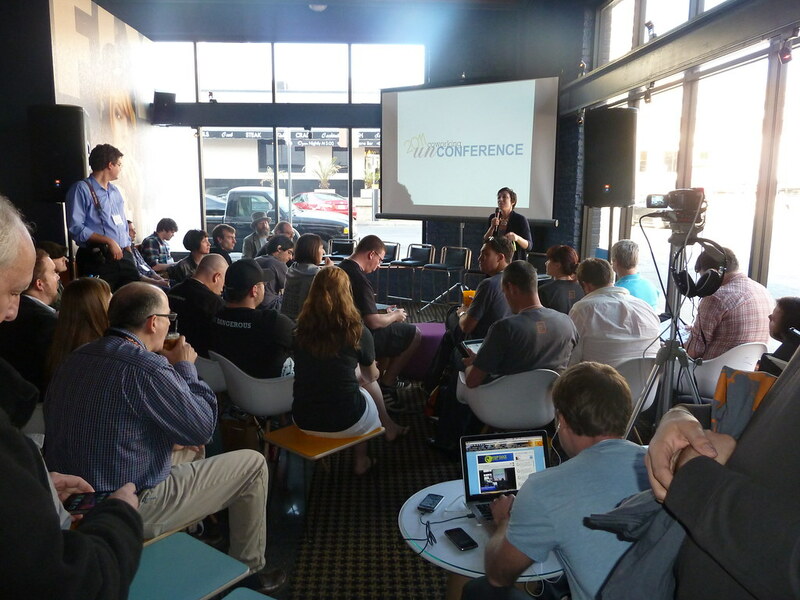 She is the co-author of “Coworking : building community as a space catalyst“, and spoke about it during the Coworking Unconference, which took place on March 10th in Austin (Texas). “As a former human ressources manager in a traditional organisation, I was just sending emails and fullfilling ineffective tasks, she says, Today, as a coworking space catalyst, I spend my time listening to people. That’s the best version of human ressources development. Ironicaly, I had to leave a company to actually practice my craft”. Building a community before the opening up of a coworking space is critical, says Angel. Coworking spaces which opens without having a community already sticking people with each others take such a long time to build it that they can have to shut down before reaching the occupation breakeven point.